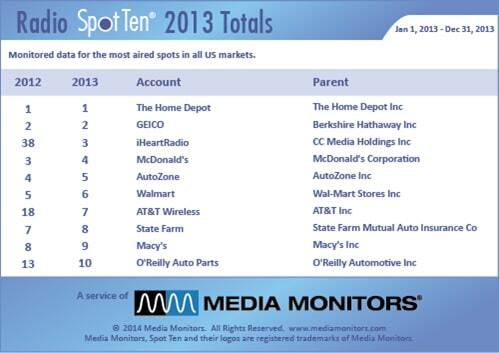 Media Monitors – The Leader in Local Media Monitoring – has released its year-end research on spot counts on Radio for 2013. On the Radio last year, THE HOME DEPOT was #1 again with 2,254,684 spots on national radio. GEICO, the insurance giant, landed at #2 again last year airing 1,976,492 spots. IHEARTRADIO leapt from #38 to #3 with 1,600,619 announcements on the air. MCDONALD’S was #4 running 1,430,138 spots, while AUTOZONE parked at #5 with 1,008,174 ads. WALMART dropped from #5 to #6 with 856,274 spots and AT&T WIRELESS surged from #18 to #7 with 837,103 spots. STATE FARM planted at #8 airing 814,994 commercials, while MACY’S settled at #9 with 793,981 spots. Coming in #10 was O’REILLY AUTO PARTS with a total of 753,123 spots for the year 2013. The data is from all Media Monitors stations in the United States from January 1, 2013 to December 31, 2014. Markets can be found here.